We offer several different fabric options in a range of colors to allow you to personalize your yurt. Use the color selector on this page to find the combination that's right for you! Our roofs are made of heavy duty architectural fabric and are made to withstand years of exposure to the elements. We weld all of our roofs using a vinyl welding machine, eliminating the need to stitch them together. This creates a water proof barrier that ensures our roofs don't leak the seams. Made from Vanguard™ fabric, our standard roof is warrantied by us for 8 years.Vanguard® is a waterproof long life commercial canopy fabric that prevents moisture and other factors that warp, wear, or fade other fabrics. Dampness and wetness can penetrate other fabrics, making them stain or mildew right before your eyes. With Vanguard®, you don’t have to worry about water damage or wear-and-tear. Any water that falls on your awning beads up and runs right off. The optional heavy duty roof cover, made from Duro-Last® material, comes with a 15-year manufacturers warranty. The Duro-Last® membrane is a proprietary thermoplastic formulation consisting of resins and plasticizers, stabilizers, and flame retardant / UV absorbents. This membrane is then laminated to a weft insertion knitted scrim that is produced by over-stitching, a non-woven web. Because of this composition, the Duro-Last® Roofing System provides you with a leak-proof roof! Duro-Last® is a leader in cool roofing solutions. The Duro-Last® white roof reflects up to 86% of the sun’s rays, resulting in saving up to 35% on energy costs! The valance attaches to the roof at the same point that rafters attach to the lattice, and overlaps the walls to make them watertight. If you're choosing our standard wall option, you can choose to have your valance match the lower wall panel. If you're choosing our custom wall option, the valance will be the same color as your roof fabric. If you choose our standard wall panel option, your wall will have a top panel made of Starfire™ fabric, and a bottom panel made from Patio 500 fabric with a different color. The upper panel is made of Starfire™, a strong 15 oz. acrylic coated polyester/cotton blend that looks and feels like canvas. To view a close up of this fabric, click here. The lower panel is made of Patio 500®, a heavy duty vinyl laminated polyester that has a slightly pebbled surface. To view a close up of this fabric, click here. If you choose our custom wall panel option, your wall will be a single color and will be made completely from Starfire™ fabric. If you're seeing this message, you're either viewing this webpage on a mobile device, or you do not have flash enabled for your browser. 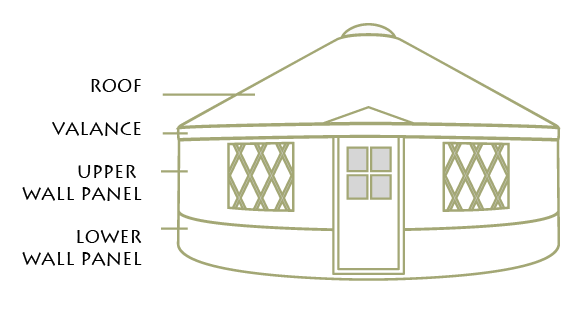 To view our Yurt Color Selector, you will need to use a computer and enable Adobe Flash Player for your browser. For instructions on how to enable flash, please click on the link below for the browser you're using.